Mawra’s Mistake and Point Out by People on Asia Cup 2018!!! The recent match was played between Pakistan and Afghan Team and the winner was Pakistani green shirts. It was really an honor for whole Pakistani country. Many people wish all the best and congratulations on this great achievement. A very charming and beautiful Mawra Hussain also appreciate the team’s performance and by mistake she post Asian Games instead of Asia Cup 2018 on Twitter. Many people making fun and criticizing Mawra on this action. 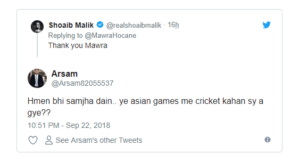 Mawra appreciate the performance of Shoaib Malik in Asia Cup 2018 but people point out her post on Twitter and making fun. The complete details about this matter are here as all the replies from other people on Mawra’s post are here for you. The previous match was played between Pakistan and Afghanistan and the winner team was Green Shirts. Many people say congrats to whole team and Mawra also tweet on het Twitter account for Shoaib Malik, As he perform very well in this match. 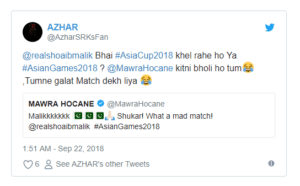 Mawra make a mistake as she tweet and use the hashtag of Asian Games despite of Asia Cup 2018. This was written accidently by Mawra but people are criticizing as this is not the Asian Games. She used the hashtag of Asian Games instead of Asia Cup 2018. Due to this people are taunting her and criticizing her on this mistake. Shoaib Malik say thanks to Mawra but not focused on the word Asian Games. He did not focus on her mistake and say thanks to her. After this fans point out this mistake and make more fun of the word Asian Games. Now many people are criticizing Mawra on this mistake. A man named Arsam said when Cricket comes in Asain Games please told us also this. Here is the reply of Arsam on Mawra’s tweet as you can see in the picture. Another male named Azhar asked question to Shoaib Malik that: brother are you playing Asian Games 2018 or Asia Cup 2018. As well as he also said Mawra how innocent you are you watched a wrong match. Abdal correct Mawra’s mistake and said it is Asia Cup 2018. Another man Naveed Memon criticized by saying that it is the new news that Shoaib Malik played well in Asian Games 2018.